Eugene Nock with the original Batcopter and Batmobile. 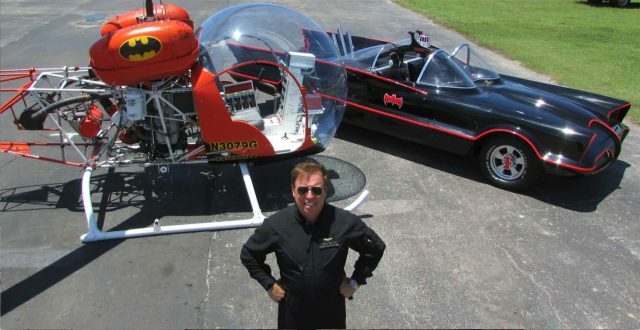 Fans of the original Batman TV series, and we are big fans, who want to get up close and personal with movie lore can do so at the Sebring Sport Aviation Expo, starting next week, where the Batcopter and Batmobile will both appear. The original TV series, starring Adam West as Batman/millionaire Bruce Wayne and Burt Ward as Robin, was a huge hit. And viewers who think of the Batcopter as being a regular part of the series are a little off. It did appear briefly in a couple of episodes, but it was developed for a one-off 1966 movie called, sensibly enough, Batman. It was a real, functional helicopter, though, a Bell 47 which was fitted with a special paint scheme and which had wings affixed along the side of the craft. In order to fly with the wings, the craft had to be specially insured, as the appendages caused a marked decrease in performance. They were never fitted to a helicopter again, and the studio destroyed them 40 years ago as a hedge against them ever being used again. In the movie, the Batcopter is used for such stunts as Batman fighting off an angry giant shark from a rope ladder slung beneath the Bell. It was first-rate entertainment. Unlike the Batmobile, the producers didn’t own the Batcopter. The helicopter was leased for the film and was returned to the leasing firm shortly after the filming was completed. Some addition footage was captured for use in the Batman series later on. The pilot was famed helicopter stunt flyer Harry Hauss, who has flown in more than 30 Hollywood movies. After filming was completed, the helicopter was de-super-heroed and returned to regular service, doing things like news reporting and pipeline patrol. But shortly thereafter, it was, like just about all Model 47s, retired from service as newer, mostly turbine powered helicopters took its place in the commercial world. Upon its retirement in 1978, the helicopter was purchased by Eugene Nock, a lifelong pilot and aviation education supporter who actually met Bruce Wayne, er, we mean Adam West, in the late 1960s and, well, this is where our story kicks in. 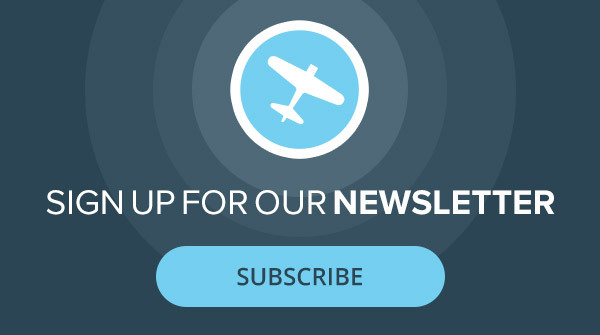 Nock has been bringing both the Batcopter and the Batmobile to the events for the past several years, and he will once again appear at the Sport Aviation Expo in Sebring, Florida (January 23-26). Again, Nock’s Bell 47 is not a replica of the Batcopter. It’s the genuine article! Well, as genuine as a fictional helicopter can be, anyway. Check with Richard Hart at National Helicopter Service in Van Nuys CA… they owned and operated the original helicopters used on Batman. Richard mentioned to me that they destroyed the wings, not the studio, and the destruction was more recent than 40 years ago. Harry Hauss flew in well over 1,000 motion pictures and television shows, he was actually the first “movie pilot”. The studio did not destroy the wings, I did as I helped build them. It was my decision to never let them fly again on an aircraft I did not own due to possible liability issues.